No matter the style we are sure we have the perfect knitting pattern for you! At Minerva Crafts we have over 1000 knitting patterns for all members of the family (including the dog!) plus many accessory and home decor patterns for you to try. 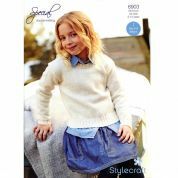 We stock patterns from the top brands including King Cole, Sirdar, Stylecraft and Sublime, plus many more. Our patterns cover all the seasons too, so whether you are looking to knit a glamourous evening top, a cotton cardie for summer, or to fill your wardrobe with big, cozy winter knits for the cool months ahead, we've got it covered!